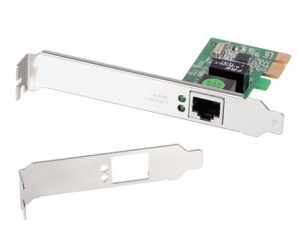 The EN-9260TX-E network adapter for PCs with PCI Express slots offers the latest technology in power management and Gigabit Ethernet network connectivity capability. The EN-9260TX-E’s full bandwidth capability boasts a robust 1000Mbps capability through the PCI Express bus architecture. There’s no need to purchase a new switch or broadband router since the adapter’s auto-negotiation feature works with your existing switch, broadband router or hub to provide the highest network speed available (10/100 or 1000 Mbps). The adapter’s automatic full duplex capability further increases bandwidth and eliminates packet collisions by allowing data to flow in both directions at the same time.